How Can I Reduce Infrastructure Costs and Focus on my Ideas? Take 42% off the entire book. Just enter code ssawsla into the discount code box at checkout at manning.com. 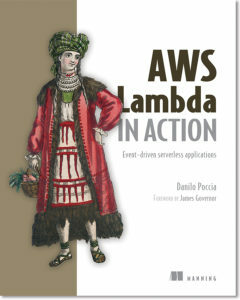 AWS Lambda in Action is an example-driven tutorial that teaches you how to build applications that use an event-driven approach on the back-end. 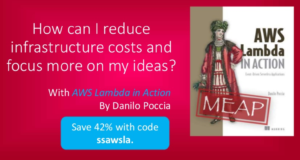 Starting with an overview of AWS Lambda, the book moves on to show you common examples and patterns that you can use to call Lambda functions from a web page or a mobile app. The second part of the book puts these smaller examples together to build larger applications. By the end, you’ll be ready to create applications that take advantage of the high availability, security, performance, and scalability of AWS.